This week 21st Century Fox announced that the $71.4 billion deal with the Walt Disney Company had reached completion. With that in mind, ComingSoon.net asked our readers which one of the major 20th Century Fox movie franchises they would like to see Disney prioritize now that they have ownership, and over 5000 of you responded! Check out the poll results below to see which Fox movie series our readers want the most… and the least! So as you can see, there’s a lot of X-citement from CS readership over what Marvel Studios will do to integrate those uncanny X-Men and all their offshoots into the Marvel Cinematic Universe. There’s also a surge of intrigue over what Kevin Feige can do with Fantastic Four after the team has struck out three times in its 1994, 2005 and 2015 incarnations. The biggest surprise may have been how popular the Alien franchise still appears to be, despite the fan disappointment with Alien: Covenant. Is it too late to bring Sigourney Weaver back? Speaking of which, James Cameron’s Avatar franchise (currently with four sequels in production) came in at #4, and given that Disney has Avatar all up in their theme parks it’s a sure bet they will treat it right. Ryan Reynolds’ Deadpool will hopefully maintain its R-rated luster now that it’s under the Mouse House roof, though we’re not sure what the status of Drew Goddard’s planned X-Force is at this point. The rest of the entries did not fare so well. Planet of the Apes finished a successful run as a trilogy in 2017, but it’s hard to figure where it can go from here now that Andy Serkis’ Caesar is dead and the series is without an anchor. Shane Black’s 2018 sequel The Predator did little to ingratiate fans with its oddball characters and promise of an Iron Man-esque Predator Killer suit. Even though the Die Hard prequel-sequel McClane is in active development there isn’t much interest in Bruce Willis shooting bad guys dressed in a wife beater. Matthew Vaughn’s prequel Kingsman: The Great Game and a planned sequel Kingsman 3 are apparently flying into theaters on a wave of apathy. Ben Stiller’s Night at the Museum franchise might be best if it remains a trilogy. At the bottom of the list is poor Ice Age coming in with 0% of the vote… that’s cold. RELATED: POLL RESULTS: Should Maya Hawke Play B.B. in Kill Bill Volume 3? As the agreement was being settled last year, it was reported by the Wall Street Journal that Disney intended to release any films amidst production at Fox. Of course, whether Disney will eventually phase out Fox properties that do not fit with their particularly family-friendly image remains to be seen. Only time will tell what precisely Disney will do—or not do—with its wide variety of newfound properties. Keep reading ComingSoon.net for future details on Disney’s acquisition of the 21st Century Fox assets! What do you think of the poll results? Let us know in the comments below! 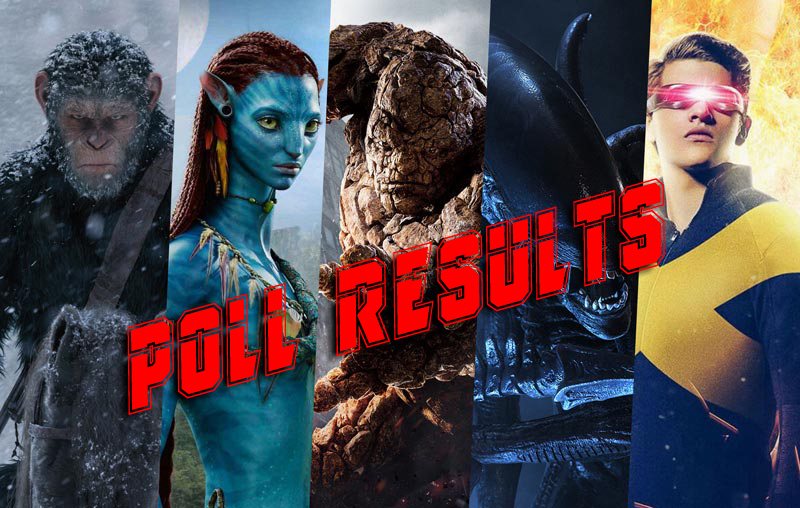 The post POLL RESULTS: Which 20th Century Fox Franchise Should Disney Prioritize? appeared first on ComingSoon.net.